Apple and its creation have always left us spell-bounded and surprisingly every iOS update comes with some of the most mesmerizing and captivating features which leave the users to try the technology at its level best and yearn for more. We all are very much aware of the latest development Apple keeps on integrating into the iPhone app development process and worth to mention those updates are always able to raise the quality standard quotient higher. Recently Apple has issued important information to all the iOS developers across the globe, which states that from the 1st April 2018, each and every new iOS app must support the iPhone X Super Retina Display. Not sure what this is all about??? 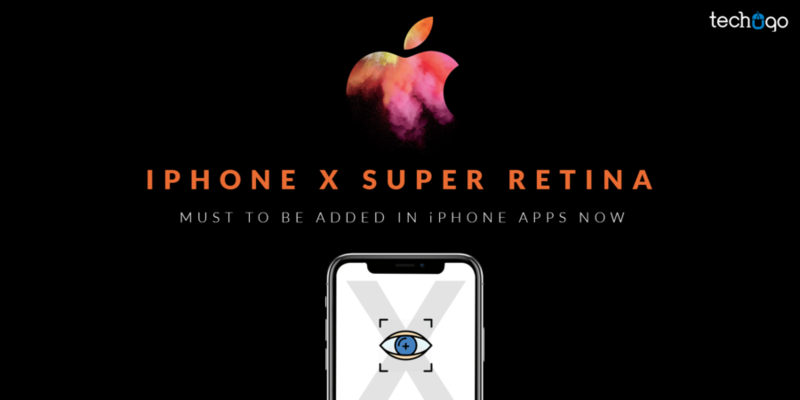 iPhone X Super Retina is engineered by Apple meeting the high standards of visual display. This is one of the best OLED display which has ever been experienced on any Smartphone till date and has the best accuracy so far in the entire mobile phone industry. The 5.8-inch Super Retina display has the impeccable contrast at a 1,000,000 to 1 contrast ratio, high brightness, and a cinema standard wide color gamut. Undeniably it creates the best color management system, the colors integrated into have the capacity to deliver the optimal viewing experience to the users. Also, it contains the High Dynamic Range (HDR), which allows the users to click the pictures in dark and light areas effortlessly. The user can see from deep true blacks to pure bright whites while retaining dramatic nuances in between. Worth to mention the iPhone X Super retina makes the pictures to look more real. As Apple has released the set of information with a deadline, which states that every app from 1st April 2018 must have the iPhone X Super Retina Display feature integrated along with this iOS developers have to keep a note that every app is developed on the iOS 11 SDK or the advanced versions. Also, the Smartwatches must be developed with watchOS 4 SDK or the latest version. As quoted by Apple, “iOS 11 has brought innovative features and the redesigned App Store to hundreds of millions of customers around the world. Your apps can deliver more intelligent, unified, and immersive experiences with Core ML, ARKit, new camera APIs, new Sirikit domains, Apple Music integration, drag and drop for iPad, and more. Well, many developers are considering this approach as a promotional activity form Apple to promote the Super Retina Display, which is indeed a future of the mobile app development process. Also, through this move, Apple wants to enhance the adoption of new features, such as Core ML, SiriKit, and ARKit which are the very much part of the iOS 11, so the upcoming iPhone mobile apps would turn out to be more unique and intelligent. So if you are looking for an iPhone mobile app for your business needs from one of the top iPhone mobile app development companies, then you must look for the advanced and compulsory feature to be a very much part of your iPhone mobile app. On the other hand, the advanced iOS 11 features are only successful on your mobile app, if your mobile app is justifying the need of the hour and is developed on the basis of users’ requirement and needs, by a leading iPhone app development company. Trust me the role of a right iPhone mobile app development company has too much significance and cannot be given a miss, because every app development company does not have the required technical expertise and the exposure to handling your app requirements, thus it is highly essential and an unavoidable aspect to pick a right app development partner for your app concept, so it can have the wings to fly higher and touch the pinnacle of success in no time.